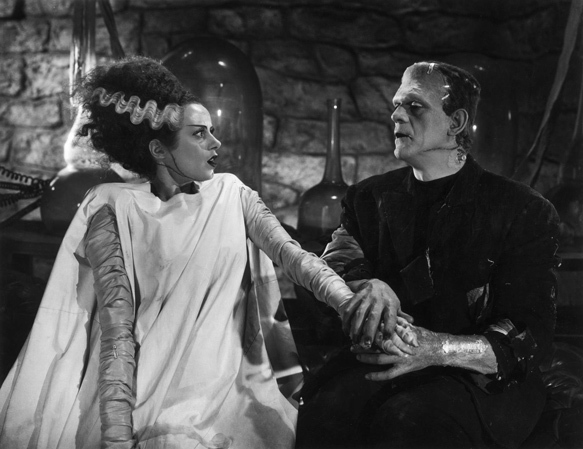 The honeymoon is still going strong for Universal Pictures’ The Bride of Frankenstein, celebrating its eightieth anniversary on April 22, 2015. 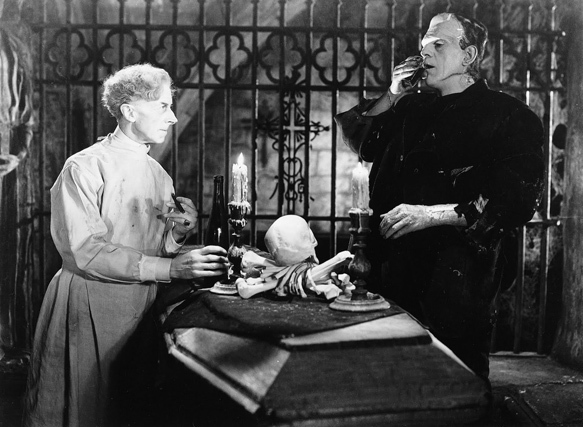 After the massive success of 1931’s Frankenstein, Universal Studios brought back the original Frankenstein producer Carl Laemmle Jr. and director James Whale to pick up the story of their last film. Interestingly, Whale originally did not want to return to the director’s chair from Frankenstein, but after four years of pleading by Universal, he agreed. This time, the script was adapted by William Hurlbut (Imitation of Life 1934, Adam Had Four Sons 1941), John L. Balderston (Dracula 1931, The Last of the Mohicans 1992), as well as a slew of uncredited writers by the names Josef Berne, Lawrence G. Blochman, Robert, Florey, Philip MacDonald, Tom Reed, R.C. Sherriff, Edmund Pearson, and Morton Covan. Cinematography was done by John J. Mescall (The Night of January 16th 1941, Sensations of 1945 1944), and music composed by Franz Waxman (The Philadelphia Story 1940, Dr. Jekyll and Mr. Hyde 1941) with make-up done by returning Jack Pierce (The Mummy 1932, The Wolf Man 1941), who paid special attention to continuity, adding scarring to the Monster from the windmill’s destruction during the first film. Opening on a mountainside castle, inside are Lord Byron (Gavin Gordon: Mystery of the Wax Museum 1933, Black Beauty 1933), Mary Shelley’s husband, Percy Bysshe Shelley (Douglas Walton: The Count of Monte Cristo 1934, Mutiny on the Bounty 1935), and Mary Wollstonecraft Shelley (Elsa Lanchester: Rembrandt 1936) singing the accolades of her novel Frankenstein, and if there is to be a sequel. The story shifts back to 1931’s Frankenstein with the burned windmill still smoldering, and the villagers are celebrating while Henry Frankenstein’s maid, Minnie (Una O’Connor: The Invisible Man 1933, David Copperfield 1935) laments Frankenstein’s death as they pull him out. Little Maria’s, who was accidentally killed by the monster in the original film, father Hans (Reginald Barlow: Werewolf of London 1935, Captain Blood 1935), on the other hand, wants proof, so he climbs into the wreckage. He is confronted by the Monster (Boris Karloff: Frankenstein 1931, The Mummy 1932), who found refuge in an alcove as the windmill came down, and is drowned. Thinking the hand coming out of the wreckage is her husband’s, Han’s wife (Mary Gordon: The Irish in Us 1935, Pot o’ Gold 1936) pulls up the Monster, and is flung to her death down the steps. The monster wanders into Minnie, who screams, and runs into the night. Meanwhile, the crowd carries Frankenstein’s body back to his fiancé, Elizabeth (Valerie Hobson: Werewolf of London 1935, Great Expectations 1946) at his mansion. Minnie catches up to them, and tries to warn them, but is told to “shut up” by the burgomaster (E.E. Clive: Charlie Chan in London 1934, Dracula’s Daughter 1936). Frankenstein lives and convalesces at home with Elizabeth until his former colleague, Doctor Septimus Pretorius (Ernest Thesiger: Old Dark House 1932, The Ghoul 1933) shows up to take Frankenstein back to his lab to show him his homunculi, lab-made tiny people, and suggest creating a bride for the Monster. As Frankenstein and Pretorius talk, the Monster helps a drowning shepherdess (Anne Darling: The Bankruptcy of Boggs and Schultz short 1916, Gamboling in the Green short 1916), but when she sees his face, she freaks, getting the attention of hunters, who wound him. 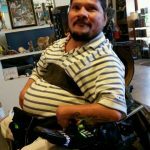 He gets overwhelmed by ensuing mob, is chained, and thrown in to a cell. Left unattended, he breaks free, wandering to a gypsy camp, where he learns of fire when his hand gets burned. Hearing a blind hermit (O.P. Heggie: The Mysterious Dr. Fu Manchu 1929, The Return of Dr. Fu Manchu 1930) playing his violin, the Monster goes into his hovel, which the hermit takes as a sign from God that he is to be his friend. There, the Monster learns to speak simply and rudimentary etiquette, until two hunters come and he has to run from them, burning the hovel in his wake. Running into Pretorius and a couple of his lackeys, Karl (Dwight Frye: Dracula 1931, Frankenstein 1931) and Ludwig (Ted Billings: Frankenstein 1931, Safe in Hell 1931), digging up a body for his bride, which he tells the Monster. By this time, Frankenstein himself likes married life, and rebukes the Monster, refusing to help make him a mate. Upset, the monster kidnaps Elizabeth, and holds her for collateral until he gets his bride. 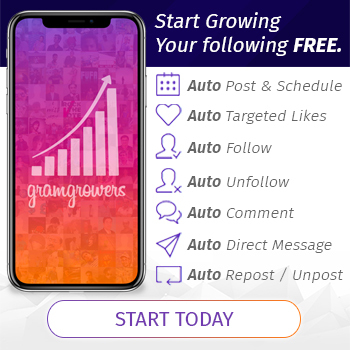 After some near misses, they succeed resuscitating a viable body, and Henry’s God complex is back in full force with Pretorius riding his coattails, exclaiming in awe, “The Bride of Frankenstein,” just as the Monster enters the chambers. 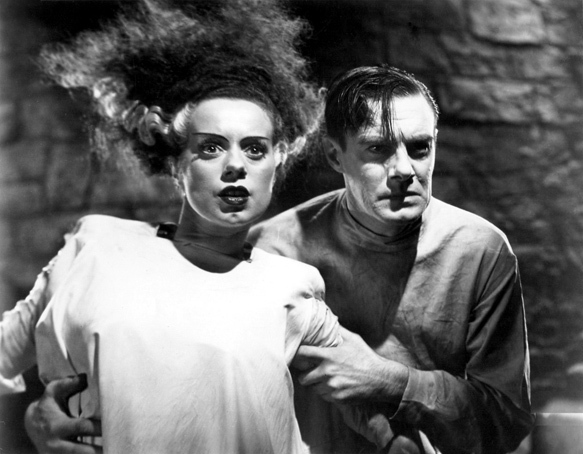 Like any film, The Bride of Frankenstein had setbacks such as going over budget and going over the shooting schedule of thirty-six days to forty-five. Other issues include multiple injuries such as Karloff breaking his hip and Clive breaking his leg. While the original trailer promised for “a lifetime of entertainment in two hours,” the final edit ran seventy-five minutes, after Whales shortened the running time from ninety minutes, re-shooting and re-editing the ending, only days before the film’s scheduled premiere date in Los Angeles. The film also did not go without controversy of religious connotation and homosexual interruptions, since James Whales was openly gay, and Clive and Thesiger were rumored to be gay, which was extremely taboo for the times. The Bride of Frankenstein garnered approximately two million dollars, which is approximately estimated as twenty-seven million dollars in 2015. 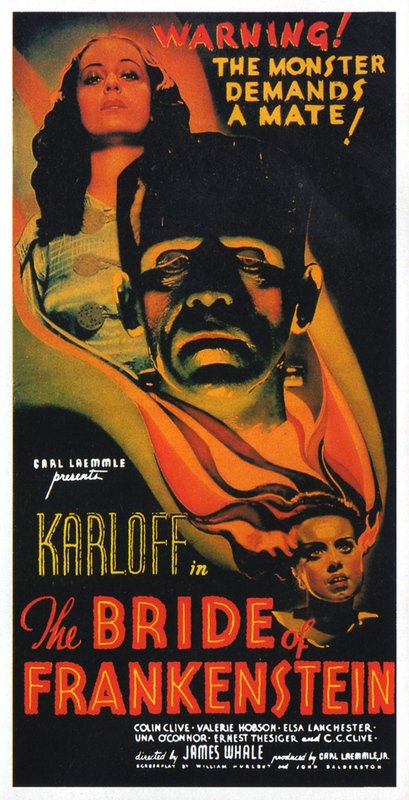 The success earned Universal’s Frankenstein franchise four direct sequels in Son of Frankenstein (1939), The Ghost of Frankenstein (1942), Frankenstein Meets the Wolf Man (1943), and House of Frankenstein (1944). It even inspired the loosely based remake in 1985’s, The Bride, starring Rock legend Sting as Frankenstein. There have been parodies made as well, starting with 1948’s Abbott and Costello Meet Frankenstein, Mel Brooks’ 1974 classic Young Frankenstein with Madeline Kahn’s beehive at the end, and a direct homage to the Bride in America’s longest running sitcom, The Simpsons, where Marge Simpson’s sports a signature beehive hairdo, fashioned after the Bride’s according to creator Matt Groening. 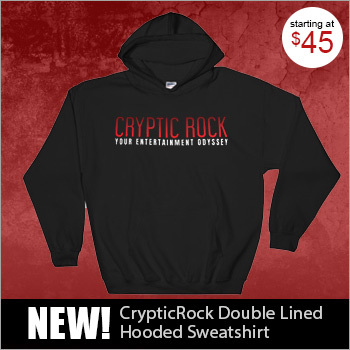 It is clear to see all these years later the impact of the film of popular culture and the classic status it has attained in the Horror genre. Often called Whales’ masterpiece, the film has also been dubbed the finest of all Gothic Horror, and often refereed to as superior to the original 1931 film. As late as 2009, there have been talks of a remake of The Bride of Frankenstein. It is said imitation is the best form of flattery, even eighty years later.